Google Pixel 2 XL Review: the Pixel you want! Distinctive design, intelligent software, outstanding camera, does the Google Pixel 2 XL have it all? Let’s be honest – the Google Pixel 2 XL is the Google Pixel you want. While last year's Pixels looked virtually identical, this year, Google has a split design-wise, with the Google Pixel 2 featuring a more traditional screen-to-bezel ratio, while this jumps on board 2017's biggest smartphone trend – an edge-to-edge display. I think that instantly makes the Google Pixel 2 XL more desirable, regardless of whether you prefer large or small screens. What else has Google added to the mix? Well, for a start, the camera has been upgraded, now with some impressive portrait effects, the design has been tweaked to make it more distinctive, and Google has improved the software in just about every way. But is it enough to stand toe-to-toe against the brilliant Samsung Galaxy Note 8 and iPhone 8 Plus? We've been using the Google Pixel 2 XL for a few days to find out. Before we start it's worth noting I've also reviewed the standard Pixel 2, which is very similar to the Pixel 2 XL. This review will mainly be talking about the differences to its smaller sibling, so I suggest you check out the other review for a more in depth review of this year's Pixel phones. Our biggest problem with the smaller Google Pixel 2 is the inexcusably large bezels at the top and bottom of the screen. Thankfully, the XL solves that with a design that minimises the bezels. It instantly makes the Pixel 2 XL look more modern, even though it's not quite edge-to-edge like the Samsung Galaxy Note 8. There is still a very noticeable bezel around display, which, when paired with Google's new moving wallpapers, works almost like a frame. We'll assume this is a design decision rather than a compromise, making the Pixel 2 XL more distinctive than its competitors (like the iPhone X's top notch). Elsewhere the Pixel 2 XL has received a tweaking in the design department. While last year's phone was critised for being bland, this year's has more of a character. It's got a quirky nature to it we really appreciate. Just like the smaller Pixel 2, the XL's metal back feels plastic like. Naturally, this makes it feel cheaper, but does make it perhaps the most grippy flagship smartphone we've used. I've certainly grown to like it. The Pixel 2 XL comes in two flavours, Just Black, Black & White (which has a cool contrasting power button). On the whole, I've got a positive view of the Pixel 2 XL's design, it shows Google now has a clear design direction for its flagship devices. As we've already touched on, the Google Pixel 2 XL really sets itself apart by its screen. The big brother now features a 6-inch P-OLED screen with a 1440 x 2880 resolution and 18:9 aspect ratio. That means a pixel density of around 538 PPI. Originally we thought the Pixel 2 XL's P-OLED screen looked a little lackluster compared to its rivals, and that the standard Pixel 2 display looks brighter, sharper and generally more impressive. However, we're happy to say that Google has quickly addressed this with a software update, adding a 'Saturated' display mode. This drastically improves the display, although it still lags behind Samsung in this department. 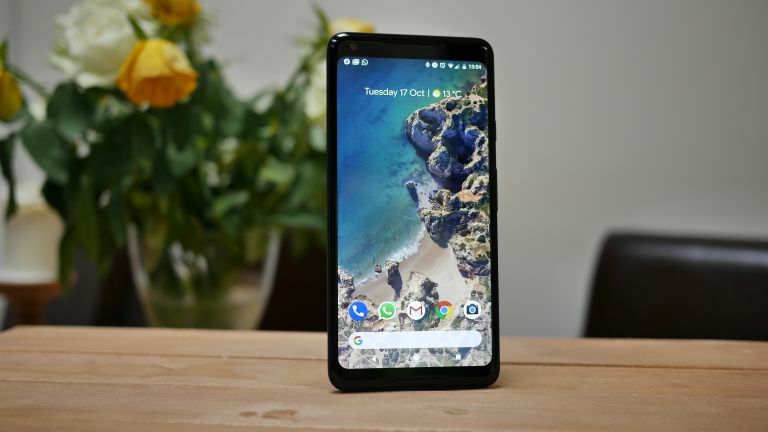 The Pixel 2 XL new features and ambient 'Always On' display, which continues to show key information and notifications even when the screen is off. This is a nice touch but has been seen before – what's really impressive is that it'll also tell you what song is playing in the background, like an instant Shazam. Inside that large body there's also space for a larger battery. The Google Pixel 2 XL features a 3520 mAh capacity with quick charging. We were really impressed with the Pixel 2 XL's battery life, easily managing a day with moderate/heavy use. It's worth noting, due to the metal design, there's no wireless charging. That's not a major issue right now, as it's rather slow and not very prevalent, but we'd expect to see it in the Pixel 3. Everything else about the Pixel 2 XL is identical to the smaller Pixel 2, so we strongly suggest you go and read that review now. Like, seriously, read the full Pixel 2 review. The Google Pixel 2 XL features the same Qualcomm Snapdragon 835 chipset, 4GB RAM, and either 64GB or 128GB of storage. It also has an identical 12MP, f/1.8, OIS camera which uses software to create an impressive portrait mode effect on both the front and rear sensors. Of course, it also runs the same software. Shipping with Android Oreo with a light Pixel launcher over the top. The Pixel launcher adds some light user experience enhancements which make using this large one a bit easier with one hand. For example, putting the Google search bar at the bottom of the home screen, and the on-screen power controls right next to the power button. Now seriously, go and read our full review of the smaller Google Pixel 2. We think the Pixel 2 XL's edge-to-edge screen makes it the one to go for. Which of these Android titans is superior?